On Sept. 20, Hurricane Maria devastated the island of Puerto Rico, leaving many of its citizens without vital resources, including food, water, power and shelter. 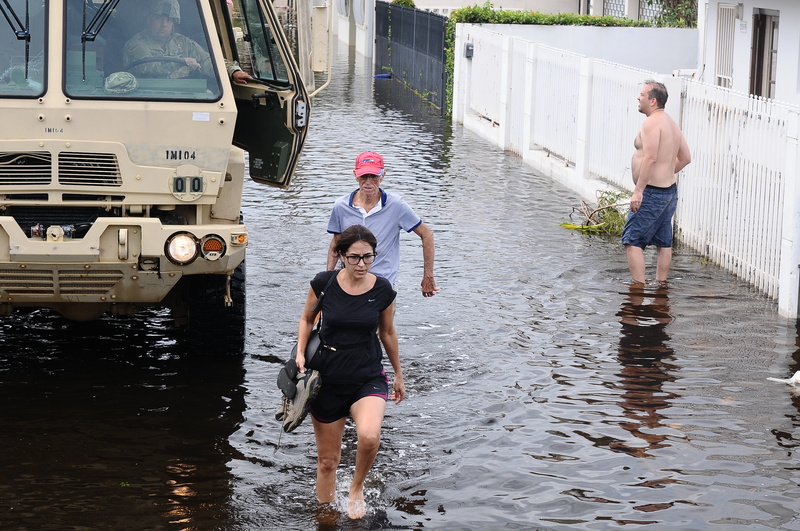 The category five hurricane prompted representatives from Stony Brook Medicine and the Health Sciences Association to take action. Dr. Kenneth Kaushansky, MD, MACP, who serves as dean of the School of Medicine and senior vice president of health sciences, worked to organize medical school students and physicians to aid recovery efforts in Puerto Rico. Kaushansky and Megan Toohey, chief deputy to the senior vice president for health sciences, organized drop boxes across campus for students to donate to Maria victims. The first shipment was sent out on Sept. 30. “The financial donation component will most likely enable us to purchase the medical supplies needed,” Toohey said, referring to the supplies required by the volunteer group she and Kaushansky are working to dispatch. Acceptable donations must be unopened and include batteries, flashlights, portable lanterns, feminine hygiene products, diapers, baby wipes and cases of water. They are being sent to the Empire State Relief and Recovery Effort for Puerto Rico and the U.S. Virgin Islands. “We are working on getting volunteers together, most likely clinical staff and emergency medicine physicians to go to Puerto Rico for two weeks,” Toohey said. The team of 24 volunteers includes eight nurses, eight paramedics, and four physicians – most of whom work in emergency medicine. They will be spread throughout Puerto Rico’s 69 hospitals and the field, to help those suffering from injuries and trauma. Thus far, the team has not departed. “They are expected to go, probably, on the 26 [of October],” she said. The plan is to have members of the team depart in small groups, with volunteers being the first group to make the flight. Toohey said a means of transportation is still being planned, and that the Emergency Department is still in the process of selecting volunteers – though the preference is people with emergency training, a military background and/or someone from family and preventative medicine. From there, the volunteers will need to configure how their positions will be filled during their absence. Kaushansky is also organizing for medical students in Puerto Rico to be transferred to Stony Brook. A similar practice is in place at Hofstra University. The State University of New York (SUNY) is extending in-state tuition to students who are displaced by the tropical storm, as well as those who are from Puerto Rico and the Virgin Islands who are already enrolled. Toohey said that with all the media recognition, students and volunteers are being drawn on to help with the efforts. She has been receiving calls from individuals offering their services. Students are also being inspired to help donate to the cause. “I agree with Stony Brook University’s relief organization for Puerto Rico,” Ksawery Surdel, a junior health science major, said. “We’re coming from a diverse background here. Any kind of support is awesome: mental, physical, emotional. If there’s anything we can do to help out, we should because these are desperate times. Once you help somebody it shows what’s inside of you. If you’re able to help, you should go out and do it. Giving is better than receiving.” Surdel said he plans to donate to the relief efforts. Members of the Stony Brook Health Sciences Association are also starting their own relief efforts. Megan Vega, a senior athletic training major and president of the Health Sciences Association is raising funds for the hurricane-torn nation. She was inspired to initiate the collaboration by her family members, who are currently in Puerto Rico. “I started brainstorming before the organizations so I figured, ‘why not get something on campus?’” she said. Donations were first accepted during Stony Brook’s annual homecoming game on Saturday, Oct. 14, and will again be accepted during the next event, which has not yet been scheduled. “We had to compete with all the other homecoming [activities], which took a toll on donations,” Vega said. Despite hardships, her team was still able to scour up at least 10 cases of water. There are several different drop box locations across campus. Donations can be made on levels 16 and 18 of the Health Science tower, level two of Surgical Oncology in the Cancer Center, levels one and five of Patient Advocacy in the University Hospital and in suite 11 of Technology Park. Monetary donations can be provided via a check made out to the “Stony Brook Foundation” and mailed to Nina D’Alessandro, HSC, Level 4, Room 172, 8430. To donate via credit card, contact D’Alessandro directly at nina.d’alessandro@stonybrookmedicine.edu or (631) 444-2693. A previous version of this story listed Rawson Jahan as the author. Maria Cestero wrote the story.